For anyone who has been following me from the beginning, you might remember a series I used to do called Bag Spy: What's in her bag? It was all about investigating the beauty cupboard contents, makeup bags etc of amazing women. Without any more blabbing I present my fist amazing woman of the series. So I got chatting with Halima and asked her to share a little about herself, beauty products and favourite things. I'm a 25 year old (gosh I'm getting old) self taught makeup artist and skin care junky. My blog is a beauty and makeup blog that was inspired by boredom ( I'm not joking I was really bored when I started blogging) . 2. What does beauty mean to you? Beauty to me is simplicity. 3. What is your earliest beauty memory? Is it ok to say my earliest beauty memory was the day I was born. My mother is half Kanuri and if you're a Nigerian you know how the women take care of themselves. My first beauty experience was my first olive oil bath / scrub by my grandmother ( probably explains why I love my skin ). Oh and I started wearing locally made kohl kajal as a baby. 4. Lets talk skincare - tell us about your favourite skincare and make up products and why? Yikes this is going to be hard because I have a lot of FAVOURITES. Skincare: Emma Hardie moringa cleansing balm, this is probably the best cleansing balm I've ever tried. It's perfect for all skins types. I use mostly at night to take off my makeup. Makeup: Diorshow blackout mascara. Its the only mascara I've been loyal too for yearsssss. It's the blackest mascara on the market and never clumps. 5. Do you have a beauty secret/tip you can share with us? WATER WATER WATER. You can buy all the beauty products on the market but if your diet is crap , non them will work. Drinking water removes toxins from your system. 6. What is your favourite way to rest and recharge? Sleep!!!!! I don't watch TV ( yes I'm odd) . I usually have a hot shower and peppermint tea before bed. It's my favourite way to recharge. 7. If you were given £100 to spend – what beauty or style items would you buy? 8. What words, quote or advice do you live by? 9. If you could give your 18-year-old self any advice what would you say? Don't worry too much about the past. Enjoy life one day at a time. 10. 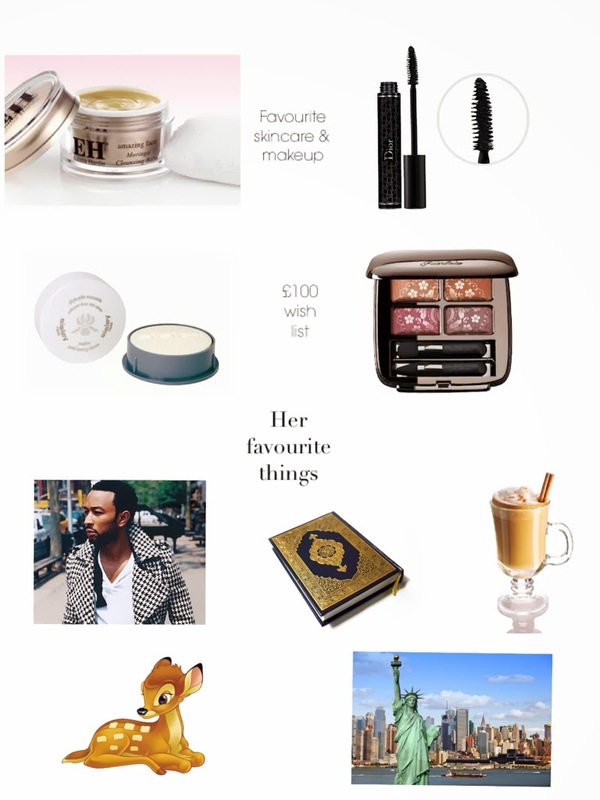 What are Halima’s favourite things? Be sure to stop over on Halimas blog here and say hello. She is so lovely with an extra dose of cheekiness. P.s I had to throw in this image - it really shows her personality to a tee. P.s.s I seriously do need some suggestions for a new title. I know you guys have skills :-) so please share some ideas in the comments below. Halima is a pretty girl, really simple yet beautiful. i think you should stick to the title" Bag Spy!What's in your make-up bag. Some people might not be bloggers hence the title "girl behind the blog" will not be suitable for them. And your doing a nice job here! !